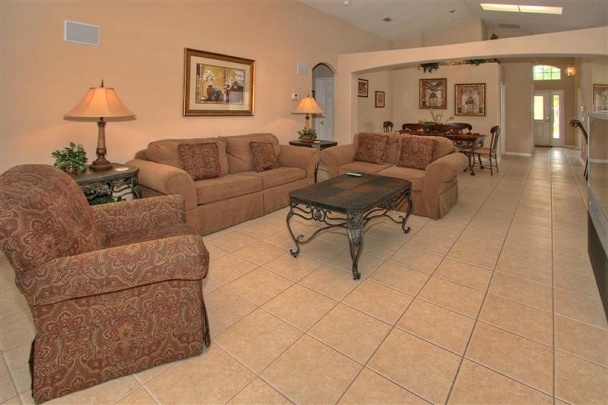 Come home from a busy day at the Orlando theme parks and relax in the huge living area. There is a 50" cable TV with DVD Player. Watch movies in Dolby Digital 5.1 surround sound and enjoy the experience of the built in speakers. There is plenty of room for the kids to play and they are just going to love all the toys we have for them to enjoy. French doors in the living room open out directly to the pool deck. It is easy to stay in touch as your Solana Villa has free wireless internet access and free local, long distance and international calls. 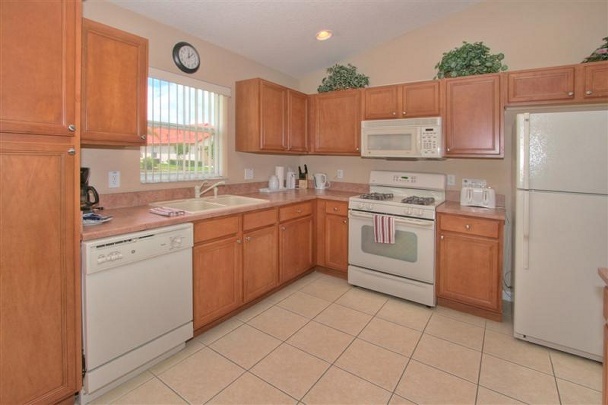 This modern spacious kitchen has everything that you need. This is your home away from home. You will find full size refrigerator and freezer, gas cooker, microwave and coffee maker. You can cook a meal or heat up a take out (see our Solana Resort Restaurants page). Everything that you need is here. 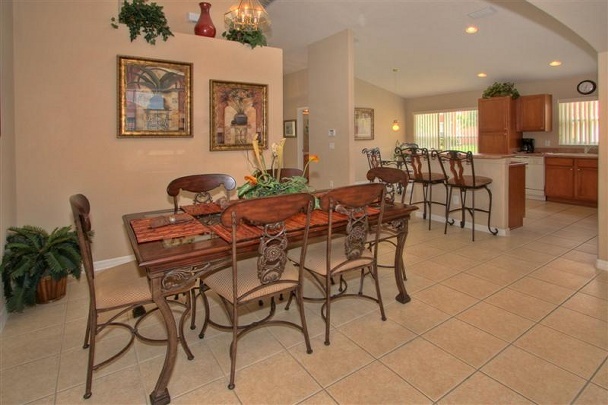 There are plenty of dining options for you and everything is close to the kitchen in this open plan living design. The dining room table seats 6, there is a table in the kitchen nook for 4 and there are 2 barstools. 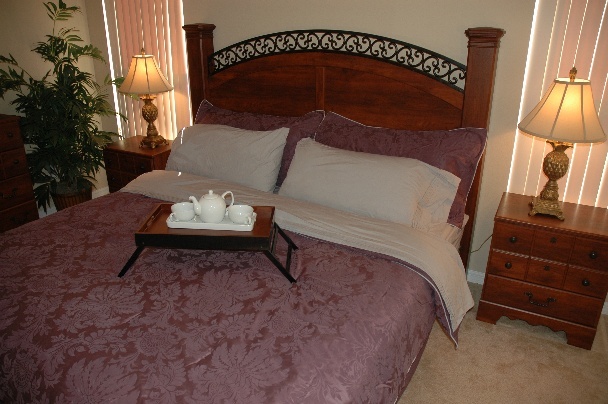 Enjoy the luxury of this master suite with King sized bed cable television and DVD player. It even has built in surround sound speakers so that you can listen to your favorite music. 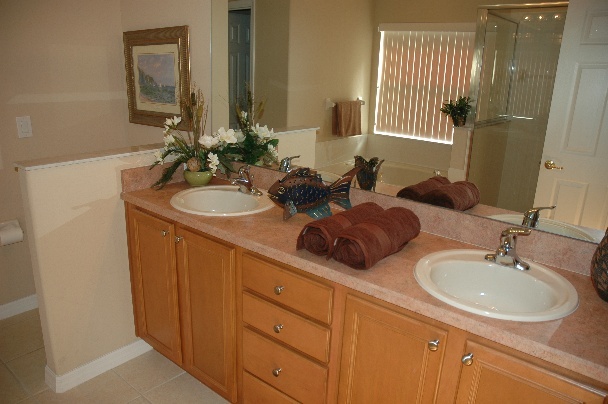 The master bathroom has a large roman tub and walk in shower. The swimming pool is only steps away as this suite has direct access to the pool deck. This master bedroom also has a King sized bed cable TV and DVD player. The en suite bathroom has a bath and shower. Another convenient feature is direct access to the pool deck from the bathroom. 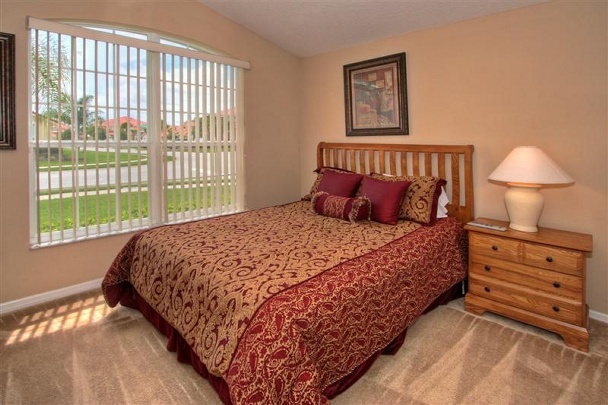 This beautiful Queen bedroom is located at the front of the house. Here you will find cable TV and DVD player. There is a family bathroom next to this Queen room. One of the two family bathrooms is located right next to the Queen bedroom. It has a bath and shower. Imagine a room just for your own Disney Princess. This magical room was designed with the help of my daughter. The one time she got her choice of anything she wanted! So your Princess will enjoy playing with all the toys and playing dress up with the costumes. 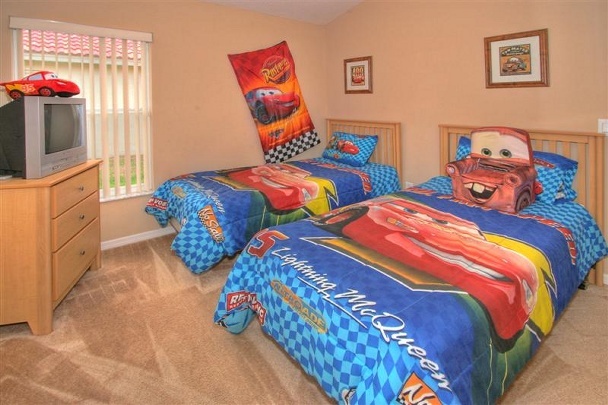 It is time to join Lightning McQueen and his friends in this Disney Cars themed room. This one was designed by my son so you can be sure it is just what your little one will want too! It has cable TV and DVD Player and plenty of toys to play with. 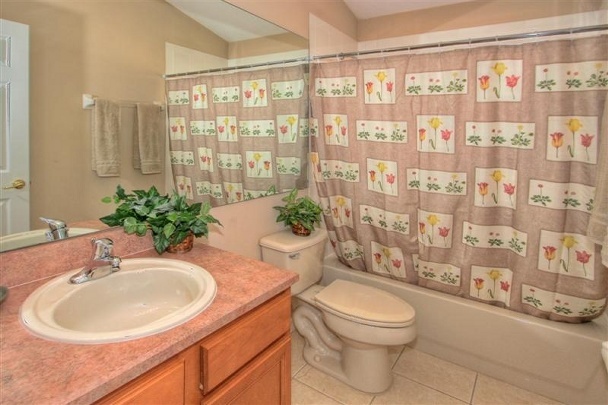 This second family bathroom is designed for the kids. It is conveniently located next to the Disney Cars and Disney Princess themed rooms. 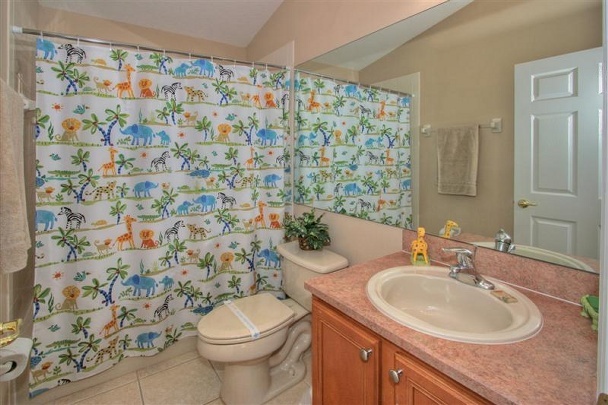 It has a bath and shower and the room is designed with a fun animal theme. This 36" swimming pool is not only one of the largest on Solana resort it has one of the largest pool decks too as it is extended out from the side of the house. The pool has a beautiful spa and also unique water fountain features. Another great benefit of this pool is the solar heating which keeps the pool at a great temperature for much of the year. Gas pool heating is also an option for the colder months. Enjoy some family time in the pool. Relax and just soak up the sun. 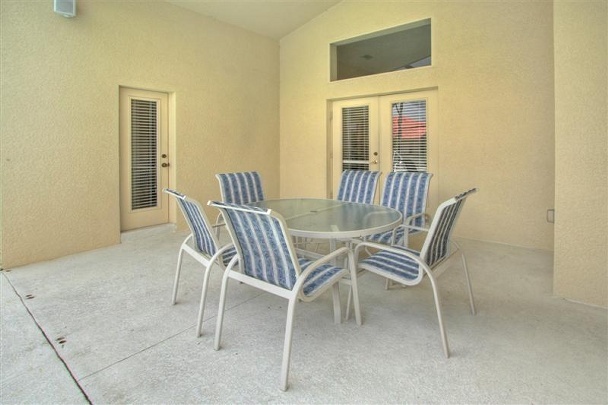 There is a shaded patio with table and 6 chairs if you want to enjoy some outdoor dining. You can listen to your favorite music as there are built in outside speakers. Prices are shown on the Solana Resort Rates page.